Newfoundlands, which are often called Newfies or Greater St. John’s Dogs, are long-haired, loyal, and large dogs that have a rather uncertain ancestry. 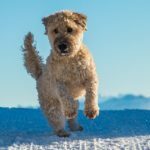 No matter the breed’s heritage, these dogs are well suited to the island they originated from, since they have a heavy coat that offers excellent protection from the cold waters and long winters that occur on Newfoundland Island. Since the dogs have partially webbed feet, they are great swimmers and can easily travel over shores and marshes. Since they are large and strong, they make great fisherman’s assistants and water dogs, and their calm disposition also makes them a wonderful family dog. 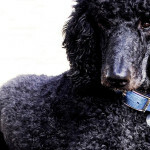 Here’s a closer look at what’s known about their history, their appearance, grooming, and more essential breed information. 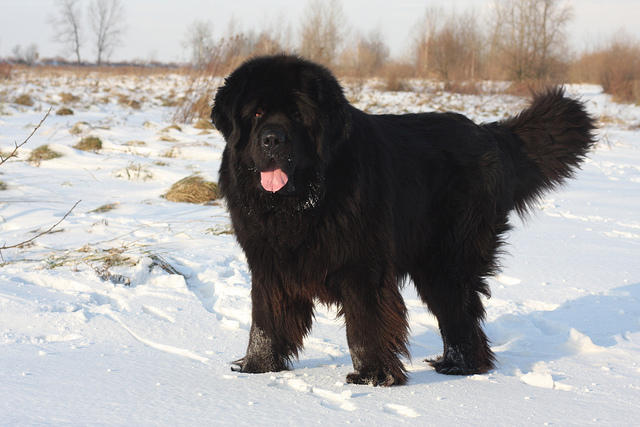 The exact origin of this breed is unknown and a lot of debate surrounds the origins of the Newfoundland. Some think that these dogs may have come between a cross between a Pyrenean Mountain Dog and indigenous Eskimo or Indian dogs. 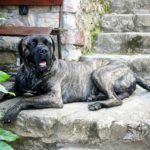 Other experts think that these dogs may trace back to the ancient Tibetan Mastiffs, which may have come with migrating tribes to the Polar region. Modern thought is that some of the local fishermen may have started to breed larger European imported dogs with smaller Canadian dogs. However, the Great Pyrenees and the Portuguese Water Dog are still thought to have been a part of this mix at some point, leading to the Greater St. John’s Dog, which would eventually develop into what is known as the Newfoundland today. No matter the exact heritage of Newfoundlands, these dogs were bred to be working dogs that were at home on land and in the water. Some records show that these brave dogs saved many individuals from drowning by taking lifelines out to survivors of shipwrecks off the coast of Canada. 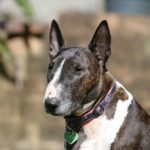 At some point, the breed made it to England, and they were bred extensively and quickly became popular. Shortly thereafter they were brought to the United States. In 1930, the Newfoundland Club of America was first founded. 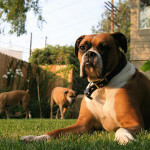 Today, within the United States, these dogs are usually kept as companion dogs. They excel in competitive obedience, carting competitions, water trials, backpacking, and more. The breed also does well in the conformation show ring. 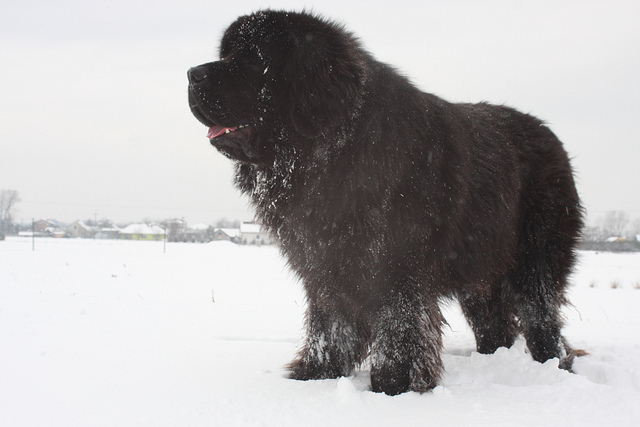 The Newfoundland is a massive dog that is stately and strong, featuring a heavy, broad head. 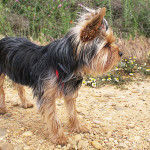 They have a short, square muzzle, pendant, triangular ears, and dark brown eyes. 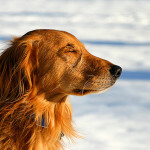 The expression of this breed is dignified, intelligent, and soft, and they generally have a black nose, although brown noses are possible in brown toned dogs. Newfoundlands are strongly muscled and heavy boned, giving them power and mass. When these dogs are relaxed, their tail hangs with a slight curve on the end or straight. However, the tail is carried out when the dogs are moving, although it doesn’t curl up over their back. They have webbed feet, which makes them great swimmers. 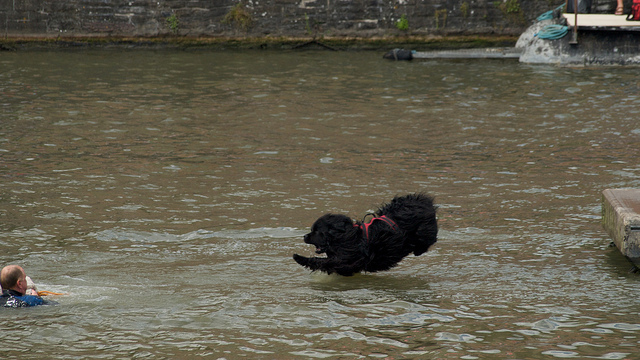 Newfoundlands have a water resistant, thick, fluffy double coat. The outer coat is coarse, long, and can be wavy and straight, while the undercoat is very dense. They may have a coat in white, black, gray, brown, or black. The Landseer pattern is black and white, which features a white base coat that has black markings. 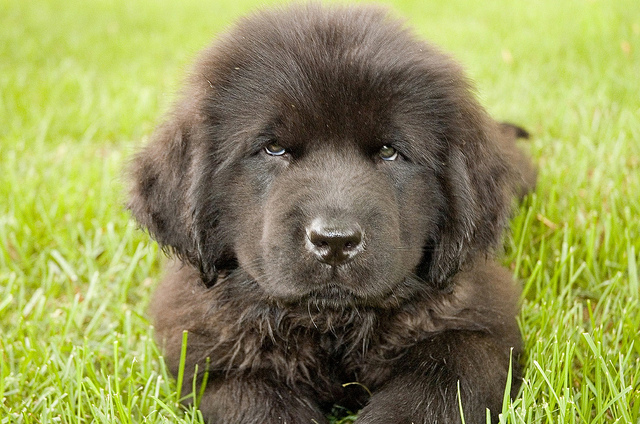 Newfoundlands with a solid coat may have some white on the tip of their tail, chin, toes, and chest. The adult males generally stand at around 28 inches high at their shoulder, while the females usually stand at around 26 inches at their shoulder. The males should weigh from 130 to 150 pounds, while the females should weigh between 100 and 120 pounds. 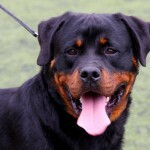 The hallmark of this breed is their sweet temperament, and they love to be with people. Since they enjoy being with people, they enjoy being included in every part of family life. 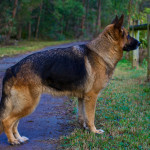 They do well with very active people who spend plenty of time outdoors, since these dogs are happiest when they have the chance to be active. 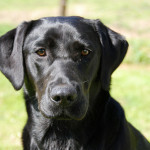 This breed does very well with children, and they are patient with small children that want to climb and play on them. While these dogs don’t need to run a lot, they do need to have plenty of walks. 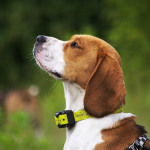 They enjoy pulling things or wearing a backpack, since this help them feel like they have purpose while helping them to expend even more energy. 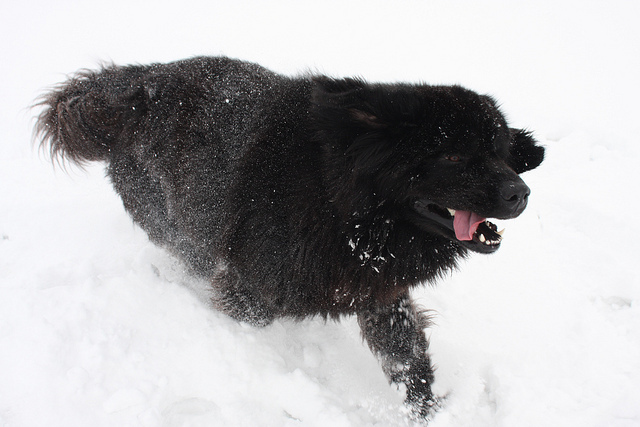 Newfoundlands enjoy playing in the snow and they love to swim. It’s important to keep them exercised regularly, since they can become a handful if they don’t get enough exercise. 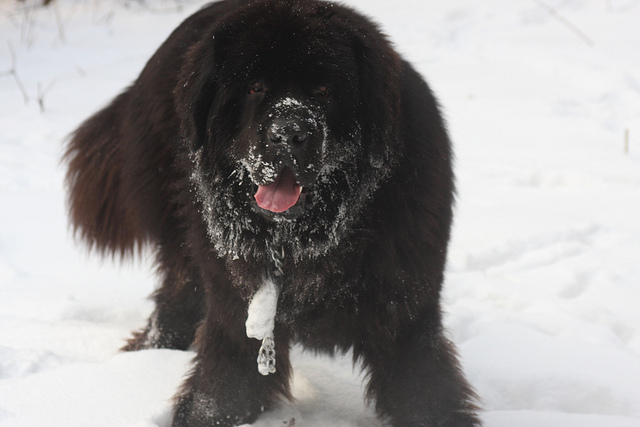 Individuals who love being outdoors and active will do extremely well with the Newfoundland breed. Since the Newfoundland has such a thick, double coat, they do require quite a bit of grooming. Their fluffy coat attracts debris and dirt, so it should be brushed each day to prevent tangles and mats and to keep it clean. When they are brushed daily, they only need a bath every month or two. 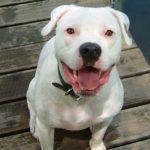 They shed moderately, although in the spring and fall, they do shed very heavily, so they can require even more brushing during these times. 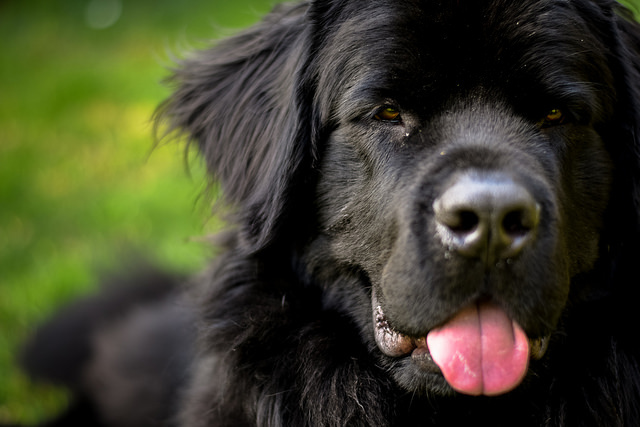 Originally, Newfoundlands were bred to be hardworking dogs, and they not only helped to rescue individuals in trouble in the water, they were also excellent helpers to fishermen. They were able to help fisherman haul in their heavy, fish nets from the water. They also did will with land tasks, including hauling logs, dragging wagons, and pulling cards. They even did well as pack animals. Still today they are used for water rescues. 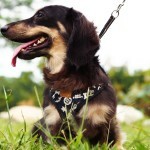 However, they are also popular pets for active families.